Let me start by making a confession . . . I have a very open sense of humor. I’ll laugh at almost any kind of humor. Having said that, I actually enjoyed this movie. I also realize, however, that not everybody will. It falls in the Anchorman, Benchwarmers, Napoleon Dynamite, Nacho Libre category of humor films. If you are a fan of those, you’ll enjoy Hot Rod. It is physical, stupid, corny, unexpected, and just plain off the wall humor. Not exactly high quality, but still very fun to watch. 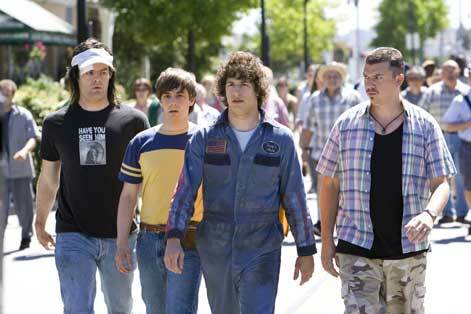 Hot Rod Kimble (Andy Samberg) has the heart of a daredevil, but he’s just not very good at it. Don’t tell him that because he laughs at the face of danger. What he lacks in talent, he gains in courage. His main goal in life is to make his deceased father proud of him through his stuntman ways, and to earn the respect of his stepfather, Frank Powell (Ian McShane). The problem is that the only way to gain Frank’s respect is to whoop him in a fight. . . something that Rod has yet to accomplish. When Frank becomes ill and requires a heart transplant, Rod steps up to the challenge of raising the necessary money to save Frank. Rod’s motivation is not necessarily love or caring, but the desire to have another chance to beat the crap out of him and thus earn his respect. Andy Samberg has stepped up to the challenge of the big screen and I think he succeeded. This being his first starring role and with the added pressure of being an SNL alumnus, it is not a bad start. You can see his potential and can only expect bigger and better things. I mean, sure, he’s no Adam Sandler, but time will tell. I was a little disappointed with Isla Fisher’s role in this movie as Denise, Rod’s love interest. Although she was radiant as always, her comedic abilities were underutilized. Ian McShane, on the other hand, does a good job of pushing Rod into manhood as his abusive stepfather. Keep an eye on Chester Tam as Richardson, a Team Rod groupie who has a very small role but oh so funny. All the characters in this movie are endearing in their own unique way. In these kind of movies, the plot is not as important as how funny the plot is delivered. In this case, not only is the plot delivery funny, the plot itself is off the beaten path. The true success of a comedy lies heavily on its dialogue. In this piece, the dialogue and its performers were made for each other. Even the musical elements fell right in line with the goal of the film. Where does this comedy place in comparison to the recent others you ask? Well, it falls after Chuck and Larry and Knocked Up (only if you like this “stupid” humor kind of movie, otherwise it might not even get placed). Not only is this Andy’s first major work in theaters, it is also Director Akiva Shaffer’s first time up and just like Andy, give Akiva some credit for a job well done considering it’s his first try. Granted, he’s also from the school of SNL so working with this cast should have been a smooth transition for him. I tell ya, these SNL folks, what a comedic monopoly. Widescreen enhanced for 16:9 televisions. Outtakes Reel: Almost 3 : 30 sec of outtakes and scenes that did not make it to the movie.